Astronomers and archaeologists (like Indiana Jones) have a lot in common, as they both look for clues to understand past events. However, while archaeologists have to dig deep underground to find fossils and ruins, all astronomers have to do is look up to the night sky. That's because when we look at objects in the night sky, we are seeing them as they looked when the light they gave off started its long journey across the Universe to us! This means that each view of the Universe reveals a snapshot of the Universe's history. Take this new picture, for example. It shows the aftermath of a collision between two huge groups of galaxies, which are called galaxy clusters. Following the collision, the galaxy clusters joined together to form what is now called the Musket Ball Cluster. In the picture, astronomers have coloured some parts blue and pink to show where different types of material are found. This isn't the first time that astronomers have spotted a collision of galaxy clusters. However, they only gave astronomers a snapshot of the aftermath of these collisions about 200 million years after impact. But this new picture of the Musket Ball Cluster was taken about 700 million years after the collision. This will give astronomers important clues about the long-term effects of such huge collisions. For example, astronomers still don't know if the collision of galaxy clusters will help or prevent new stars from forming, or if they have little effect. Cool fact: The oldest fossils found on Earth are 3.4 billion years old. But the light from the Musket Ball Cluster took a staggering 5.1 billion years to reach us! 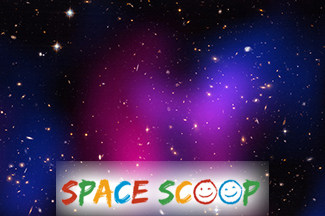 This Space Scoop is based on a NASA Chandra release. Image Credit: X-ray: NASA/CXC/UCDavis/W.Dawson et al; Optical: NASA/STScI/UCDavis/W.Dawson et al.